The name of the drill is Quick Strike and its purpose is to work on both transition offense and conversion defense. The drill is from Arkansas’ Mike Neighbors. I heard him speak at a clinic and he said that if he were allowed to use only 2 drills, this would be one of them. The description below the video is a slightly different version of the drill that he used to run. Like all of our drills, this one has evolved and improved over time. The video of this rebounding drill is hosted on You Tube. Quick strike emphasizes both transition offense and defense. It also reinforces shot selection, decision making. and eliminating turnovers. The drill is about the scoring and teaching opportunities that it presents as you try to teach transition offense and defense. You must have a score clock (shot clock is best) or a stop watch that counts down. Divide players into two-colored teams all on one end of the floor. Begin the drill by tossing the ball to the white team putting them into transition attack mode and blue team into transition defense. The clock starts at 15 seconds since we are emphasizing transition offense and a quick attack. If blue scores they are awarded points based on how much time has elapsed from the 15 second clock… For example, if they push the ball up quickly and score with 10 seconds left they get 10 points. The action never stops and White now attacks in transition as Blue defends. No points are scored if the team does not score. You will need to decide how you score points for fouls. One way would be to award all 15 points to the offense if the defense fouls, regardless of how much time remains on the clock. You can imagine the importance this places on communication and decision making. LOTS of teaching points for your transition. You can also use it as a drill to teach and rehearse milking the shot clock if you have a lead. 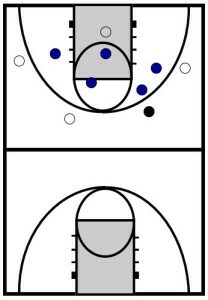 Even if you are a high school coach in a state without a shot clock, you can use this drill to have your players practice running clock at the end of the game without going into an actual stall. To practice milking the clock, run the same drill, but the team scores for how much time they took off the clock when they score. For example, if you have a 30 second shot clock or want to practice running 30 seconds off before you score without a shot clock. An example would be: Put 30 seconds on the clock and give one team the basketball. Stop the clock when the ball goes in the basket. If it goes in at 8 seconds left on the clock, they score 22 points. If it goes in at 5 seconds left on the clock, they get 25 points. When there is a change of possession, either on a made basket, a defensive rebound, or a turnover, start the clock again at 30 seconds for the other team.